Arrowhead H-D has added a BRAND NEW Master Technician on our already stellar service team. Dave joins us from Allentown, PA and brings with him nearly twenty years of experience working on Harley-Davidson motorcycles. He cut his teeth as a mechanic for Crossroads Harley-Davidson (formerly Links) followed by time at Classic H-D. He can now enjoy the beautiful year-round riding weather our city offers on his 2008 Street Glide. 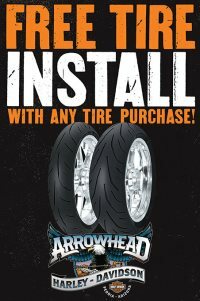 Head into Arrowhead Harley-Davidson next time you need Service and say “hey” to Dave! You’ll be in good hands with him. How Can I Increase the Life of My Motorcycle Tires? Check the tire pressure weekly when the tire is COOL with an accurate tire-pressure gauge (this isn’t your bicycle, kicking the tire or pressing won’t work) and set the tire pressure to the recommended level listed on the sidewall or what’s recommended for your ride in your owner’s manual. Avoid aggressive starts and stops that increase wear, especially on the rear tire. Avoid extremely high speeds that increase wind resistance on the motorcycle, which causes the rear tire to work harder to maintain that speed. A simple rule of thumb, any type of riding that reduces fuel efficiency will also reduce tire life. This is why rear tires typically wear more quickly when you are on an extended ride traveling at highway speeds. The additional work to propel the motorcycle against the wind, plus the elevated tire temps from high-speed riding, all contribute to fast tire wear. Just like your Harley-Davidson®, even the tires need a bath once and awhile. There may not be a lot of chrome on those tires, but soap and water can help remove tire coatings that may degrade or reduce grip on your tires.